Sir Andrew Wood was born in Leith, on the southern shore of the Firth of Forth, around the middle of the 15th century. He was the eldest son of Alexander de Wod, burgess and bailie of neighbouring Edinburgh, whose wife was Elizabeth de Crichton who inherited a portion of the barony of Leny or Lany, Cramond near Edinburgh from the estates of the glamorous Sir George de Crichton, Earl of Caithness and Lord High Admiral of Scotland, who died in 1454. Heir to his father as Chief of the Name and to a substantial ship-owning family enterprise headed by generations of landed Edinburgh patricians, Andrew was likewise a successful merchant. His ship of choice seems to have been the celebrated carrack, Flower, which he could afford to arm with the very latest ordnance being developed in continental Europe. He was a master of fighting off French, Dutch, English and Portuguese pirates.The fame of his exploits led King James III to commission him to captain his ship, the Yellow Caravel. [Yes, mediaeval monarchs, too, were in the import-export business.] Sailing out of Edinburgh's port of Leith, Andrew and his highly trained crews triumphed in many skirmishes with 'hunter-gatherer' privateers as well as in sanguinary engagements with marauding squadrons sent by the English government. Granted the lands of Largo in Fife by royal charter (1477), he was appointed §1Admiral of Scotland - the equivalent today of Admiral of the Fleet - and was knighted by 1493. He was given the superiority of the River Forth island of Inchkeith and charged to fortify it, and he received the king's licence to castellate his great house - once a residence for widowed queens of Scotland - at his barony of Largo, a tower of which still stands. From there he and his watchmen could maintain surveillance of the broad estuary of the River Forth. He also owned dwelling houses over in Leith that no doubt would have been just as opulently appointed and fitted out with stylish furnishings - much of it, like silks and damascene fabrics, fine Flemish wall tapestries and colourful, newly fashionable Bohemian glassware, conveyed from afar in the family's own trading vessels. By this time, Sir Andrew can be said to have founded the House of Wood of Largo, thus, it would seem, making his father Alexander the 5th and last chief to pass away being of the House of Wood of Ogilface. Accompanied by King James IV in July 1494, Wood commanded a squadron heavily armed with skilfully deployed cannonry that battered into submission the westerm islands strongholds of the MacDonald Lords of the Isles, thus terminating centuries of that powerful race, putatively of Viking descent, being a barb in the flesh of successive kings of Scotland. However, the remaining client chiefs there quickly resumed their feuding with the northern clans, requiring the king, his marischal, his admiral and major players like the Earl of Huntly to intervene repeatedly both militarily and by diplomacy. A rebellion in 1503 against the king's appointed governor, the Earl of Argyle, impelled the exasperated admiral to fall upon them with such overwhelming force that they unconditionally capitulated and ultimately even declared their allegiance to the king. British navy analysts and historians like Oxford's Dr. Nicholas Rodger consider that final expedition as marking the end of mediaeval naval warfare - grappling hooks; boarding parties of armoured soldiers; vicious hand-to-hand combat on fighting decks; missiles fired from mast tops - with the innovation of 'softening-up' artillery bombardments that Sir Andrew is thought to have increasingly employed from early in his career, in which case he is likely to have proposed the campaign in the first place and obtained from the king's council the money needed to pay for it. King James commanded Wood in 1497 to superintend the rebuilding of Dunbar Castle, which had been dismantled forty years earlier to prevent the English from using it. The Woods already had strong family connections with the area. The castle was to become a retreat for Mary Queen of Scots and the 4th Earl of Bothwell at the end of her reign. Due to the king's death in the slaughter at §2Flodden in September 1513 and the political instability that ensued, Sir Andrew was charged to convey parliament's invitation to John Stewart, Duke of Albany, residing in France, to assume the Regency for the infant James V. He safely brought the royal duke through hostile waters into Dumbarton on the 26th of May 1515. It was to be the Admiral's last major service for his country: Sir Andrew Wood, 6th Chief of the Name, died before the 3rd of November 1517, most likely in 1515. Enjoying the friendship of successive Stewart monarchs, his significance to Scottish history, and that of his forebears and descendants, is far greater than is sometimes remembered today. Motto: Tutus in Undis - 'Safe amid the waves'. 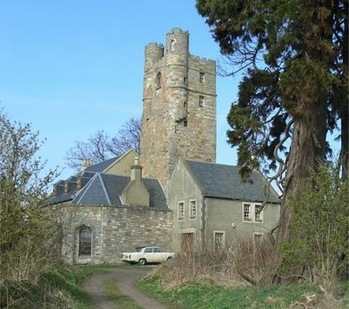 The mediaeval mansion where the Admiral will have courted his wife-to-be has long gone, but this Tower, which was erected in their lifetime, has survived and can be visited. It is not far from Largo House. Mary Queen of Scots is said to have spent a night there in 1565, when the then Laird of Lundin remonstrated with her about her Roman Catholic faith, for which impropriety the 80-year-old was imprisoned in St. Andrews. Andrew's cash flow problems would have been compounded by the successive years of adverse weather either side of the Great Freeze of 1607 that badly affected the nation's land and marine harvests around that time. [Elsewhere, 1607 marked the first of the London Frost Fairs held on the frozen surface of the River Thames.] The poor starved; the rich retrenched. Hence by 1610, Andrew Wood had taken steps to secure the wellbeing of his three sons, Andrew, John and William, and three daughters, Lilias, Isabella and Christina, before commencing the painful process of disposing of his estates, which was completed by the six siblings in a charter dated 30 September 1618 that ensured for each of them an annual rent from the receipts. Andrew, fiar of Largo, married Jean Drummond in May 1606. She died childless in 1618. Her father was James Drummond, 1st Lord Madderty who was educated with, and remained a lifelong friend of King James VI. The Stewart monarchs having left Scotland for good, Andrew became a burgess of the city of Perth in 1632 - so he was very far from penniless, dying there in June 1649, leaving no son. Neither of his brothers appears to have had children, so when William died in 1667 in Edinburgh, the direct line - eldest son to eldest living son - §4terminated. Happily representation of the Wood of Largo family devolved upon Episcopalian (Anglican) clergyman, the Rev. Alexander Wood (b1653). His lineage stemmed from Alexander Wood of Grange, the Admiral's second son named after his grandfather and g-g-grandfather; his son William of Stenton and Grangehough by Dunbar in Lothian; his son Robert, ditto; his son George ('Dode') of Newmyln and Stenton; his son William, also burgess of Dunbar, who was the Rev. Alexander's father. He died while his four children were under age, so they with their mother Margaret Liddell were put in the care of kinsman Andrew Wood, Bishop of the Isles and Caithness. Alexander died in 1710, having had four sons and two daughters by his wife Jean Brown, or Broun of Carrington (the Brouns being a significant Lothian family as old as the de Boscos). Two of their sons died without issue (dsp). The eldest and representer (head) of the chiefly family was Robert, who was Secretary or Chancellor to John Ker, 1st. Duke of Roxburghe to whose family his mother was connected. The duke was Secretary of State for Scotland for two protracted periods between 1705 and 1726, and Keeper of the Privy Seal of Scotland. In his key politico-administrative role (styled as Under-Secretary of State for Scotland) at that cornerstone of British history, Robert will have helped draft the 1706/7 Acts of Union that created Great Britain. (Ker's elevation from earl to duke was his reward for successfully steering that legislation through the §5Scottish parliament.) It was the tipping point: from then on, Scotland and the enterprise of the Scottish people provided the additional impetus that made Great Britain a world power. Robert's brother George was another admiral in the family (also dsp). John Wood (born 1722), son of their brother William of Glasgow (Chamberlain to the Duke of Hamilton) and his wife Ann Blair, was Governor General of the Isle of Man 1761-77. His Excellency recorded the Arms of Wood of Largo in 1775, when the Court of the Lord Lyon (which determines these matters in Scotland for the Crown) declared him to be Chief of the Name and Arms. His brother Andrew (dsp) was rector of Darlington and Gateshead and chaplain to King George III.Their army captain brother William who married Lady Catherine Cochrane, only daughter of Thomas, 6th Earl of Dundonald, also died without male issue. By his wife Elizabeth, John had three daughters who died young. He had a natural son as well: Major General John Wood, two Canadian descendants of whom are members of this Society. Sir Mark Wood Bt. (b. 1750) of Gatton Park, Surrey, England (he was also Member of Parliament for Gatton which was a 'rotten borough' - internet searchable), who had been a colonel in the British Honourable East India Company Service, marrying in Calcutta Rachel Dashwood in 1786, and was made a baronet in 1808, matriculating the Ams of Wood of Largo the following year; Admiral Sir James Atholl, KCB (dsp); Lt. Gen. (Indian Army) Sir George Hay, KCB of Ottershaw Park, Surrey; Andrew, Lt. RN (dsp); Thomas, Capt. Madras Eng. In 1784, Col. Mark Wood made the first ever map of Calcutta (Kolkata), to coincide with the British government at last beginning to assume controlling powers that year over the company's commercial and military affairs. On his return to GB from India, Col. Mark Wood bought in 1794 the estate of Piercefield, commanding the glorious Wye Valley near Chepstow, for around £30,000 (as well as Llananthony Priory in the Brecon Beacons near Abergavenny 5 years later), and carried out some major embellishments to the properties after this picture was painted. Piercefield was much admired by the poets Coleridge and Wordsworth. The latter's beautiful poem 'Tintern Abbey' was very likely composed during his visit to the house in July 1798. It is claimed locally that, in 1802, Admiral Lord Nelson spent a night at Piercefield with his mistress Lady Hamilton and her elderly husband, Col. Wood's house-guest Sir William Hamilton. Wood sold the estate at the end of that year for the unrefusable sum of £90,000. He parted with Llananthony in 1807. Behind Wood's sturdy boundary wall, lodges and imposing Lion Gate, the fine Chepstow Racecourse has occupied part of the estate since the 1920s. A campaign was launched in 2013 to restore the house to its former glory. The gardens of the ancient Gatton Estate were redesigned during the 1760s by Lancelot 'Capability' Brown. Col. Mark Wood purchased Gatton around 1803, before becoming a baronet. In the 1880s, the hall was acquired by mustard magnates, the Colman family. It is now a college, and part of the estate with its grand lake - where Sir Mark's elder son Alexander tragically died after falling from his horse at age 15 in 1805 - is owned and managed by the National Trust. On Sir Mark's death in 1829 at his town house that stood among the royal 'grace-and-favour' residences in Pall Mall, London, his son - another Sir Mark - succeeded, but died without male issue in 1837, taking the baronetcy with him. The Chiefship of the Name passed to his cousin George of Potter's Park, Surrey, his estate adjoining Ottershaw Park, Runnymede - yes, that Runnymede associated with Magna Carta - which he had inherited in 1824 from his father, Sir George Wood. The Lyon Clerk (pron. clark) and Keeper of the Records to the Lord Lyon King of Arms in Edinburgh confirms that George recorded the undifferenced (i.e., the original) Arms and Supporters in 1845 as 'Representative of the Ancient Family of Wood of Largo and Chief of the Name'. He married Frances Remington. George's son and heir, Andrew George, was born in July 1854. (His brother Alexander Keith had died an infant two years before, and his mother died in 1860.) His first marriage - to Ellen Bolster of 18 Buckingham Palace Road on the 18th of October 1884 - produced no children. 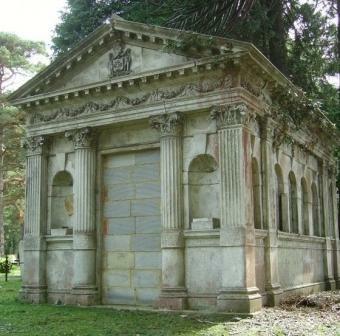 When his father died in 1892, he inherited Pittleworth, whch he sold the following year. Another part of his father's estate was Arden and Hawnby Manor in Yorkshire, prime country for hunting, fishing and for shooting wildfowl. In 1896, he bought Whitewell Lodge near Whitchurch, Shropshire. In 1898, the year Ellen passed away, Hawnby and Arden Hall were sold to the 4th Earl of Mexborough, a close friend of late Prime Minister Benjamin Disraeli. [Curiously, that same gentleman had become Member of Parliament for Gatton in 1831, two years after the previous incumbent, Sir Mark Wood, died, and just a year before such 'rotten boroughs' were disfranchised by the great Reform Act of 1832. Earlier members had included Lord Chancellor and philosopher Sir Francis Bacon (1584) and inventor Sir Wm. Congreve (1812).] Andrew George remarried in 1901, his young wife being Leila Carnegie Anstey. He died in July 1916 in Mayfair. His widow sold Whitewell in1919. She was killled in a road accident in 1924, aged only 44.
and had a son in 1924 (born in India, but sadly he died in 1944, an RAF officer in Canada), a daughter in 1926 and a son in 1928. The descendants of Ursula are the senior line today. It is, of course, an ancient and well established Scottish practice that a woman can succeed to the representation of a House in that she does not lose her maiden name on marriage, and there is no reason why her children may not take her maiden name and continue the representation in their line. Her eldest grandson, the late Timothy Michael Herbert Fawcett Wood (1952-2017), 19th hereditary Chief of Clan Wood, is succeeded by his son Joseph John Hugh Fawcett Wood of Largo. More details can be seen in the Members' Area. Summary. Holding sway over their local populations, which would have been mostly surnameless till the 14th century, the dynasty/confederacy of Wood families that occupied territories mostly on the east side of Scotland from early times never made itself conspicuous by rebelling against the Sovereign, §6feuding with the neighbours or committing any other long-remembered misdemeanours. They were dependable upholders of the Stewart monarchs and stalwarts among the nation's leading families when they protected Scotland from their opponents within and outwith the realm. Notoriety has not caused us to stand out collectively in the nation's colourful history books. But, more scattered now, we are still around – and lots of us. §2 Walter Wood of Raik, Aberdeenshire, is listed among the 'Notable Men' who fell at Flodden. By reason of his marriage to joint heiress Dorothy Tulloch in 1487, Walter was the first to be styled Wood of Bonnytoun. It is believed that his eldest son, John, also perished, for it was Walter's second son, William, who succeeded to the estates of Raik and Bonnytoun. Walter's parents were Christian de Glen (dtr. of Sir John de Glen of Inchmartine and Balmuto) and John de Wod, younger brother of Alexander, father of Sir Andrew Wood of Largo. The Arms of Wood of Bonnytoun are illustrated at the top right-hand corner of this website's home page. §3 Originally, the only ranks of nobility below that of sovereign were feudal earls (regional titles) and feudal barons who had the right and duty to be in attendance at the king's Court. When the king called together a Council or Parliament, they were obliged to attend. Later on, if an earl or baron was elevated to the higher ranks of duke (instituted 1398), marquis (1599) or viscount (1606), they remained under the same obligation and retained the same right to attend on account of stll being barons. That is why they were collectively known as peers - equals - when sitting as a legislature. Although,since the 1707 Act of Union, the House of Lords of Great Britain assumed that role in Parliament, in Scotland feudal barons who have 'matriculated their heraldic honours and achievements' through the Lyon Court are legally peers. Our Chief is such a one. §5 Its ratification of the Treaty of Union in 1707 began 'The Long Adjournment' of the Scottish parliament that ended with the devolution of many Westminster powers to the new Scottish parliament of 1999; powers that have been extended several times since then. §6 However, Sir Harie (Henry) Wood of Bonnytoun and Francis Ogilvy of Newgrange were summoned to appear before the Scottish Privy Council on the 4th of June 1616 to renew their former assurances, upon which the Council again ordered them 'to observe our sovereign lord's peace and to keep good rule and quietness in the country, and that they nor nane of them (i.e., nor any of their clansmen) invade or pursue the another, for whatsomever deed, cause or occasion ... under pain of three thousand merks.' They were still being required to repeat their undertaking 15 years later in 1631. Forasmuch as in ancient times our sovereign lord's most noble progenitors, with consent of the three estates of parliament, have judged it most convenient for good of the realm that every freeholder, spiritual and temporal, should set their lands in feu, and that our said sovereign's predecessors of most noble memory being for the time by setting of their own lands, as well annexed as unannexed, in feu ferm should give example to his freeholders to do the like, and to that effect, in diverse parliaments held in the days of our sovereign lord's progenitors aforesaid, the annexation and union of lands to the crown was dissolved; and now our sovereign lord, following the tread of his said predecessors, for the great desire which his highness has that policy should increase within his realm, has, by the advice of his said three estates in parliament, dissolved and, by the tenor of this act, dissolves the union and annexation of whatsoever lands, lordships, baronies, mills, multures and fishings made to the crown in this present parliament, or any other parliament held in his own time, or in the days of whatsoever his highness's most noble progenitors, to the effect that the same lands, lordships, baronies, mills, multures and fishings, with their pertinents, may be set in feu ferm by his highness, with advice of his *comptroller, present or to come, to whatsoever person or persons his highness pleases, and our said sovereign lord and three estates of this present parliament, by the tenor hereof, declares, decrees and ordains that this present dissolution shall stand and be of full force for his highness's lifetime, so that the lands, lordships and baronies which his highness shall set in feu ferm in his own time shall be sure and viable to the persons, receivers thereof, their heirs and successors forever, and that the annexations of lands, lordships and baronies made in any time preceding (so far as shall concern the lands, lordships and baronies which shall not happen to be set in feu ferm in his highness's own time) shall after his decease return to their own nature after the form of the dissolutions made before the time of his most noble progenitors, providing always that the said infeftments of feu ferm be not made within the just value to the prejudice and hurt of our sovereign lord and his successors, that is to say, within the duty to which the said lands are retoured or may be justly retoured for the new extent, which new extent his highness, with advice aforesaid, declares to be the just value of the said lands for which the same may be set in feu ferm; providing always that this present dissolution shall not be extended to the lands of Ruthven, Erskine and others, the Earl of Angus's lands contained in the king's majesty's signature, but the same shall remain with the king's majesty and his highness's successors to be used, occupied and intromitted with by his majesty's *comptroller present and that shall happen to be for the time, in such sort and in the same manner as the said lands were used by the lords and proprietors thereof before their forfeiture; neither shall it be lawful to any his majesty's subjects to purchase feu, tack or rent of the same of any other colour of right whereby they may pretend to interpose themselves between his majesty's *comptroller and the tenants, labourers of the lands aforesaid, which feus, tacks, rentals or others whatsoever already purchased, contrary to the tenor of this present provision, the king's majesty, with advice of his highness's three estates aforesaid, declares to have been and to be null of the law and likewise in all time coming." A Treasurer's office was created soon afterwards, and was merged with the Comptroller's office in 1610. One of the Admiral's most famous sea battles was in 1490. It began in the Firth of Forth and ended next day off the River Tay, the numerically superior English force having been overwhelmed and their vessels captured. It is said that minstrels celebrated thoughout Europe with the following lay (presumably translated as required). The English folk shall rue. May nae waur come to pass. * In the north east of Scotland, 'loons' or 'louns' are boys and 'quines' are girls.